I just bought a new bottle of Hendrick’s, which is a modern gin with roses and cucumbers mingling amongst all those other, more familiar gin botanicals. It is my favorite gin for a martini, or anything that is very gin-forward. 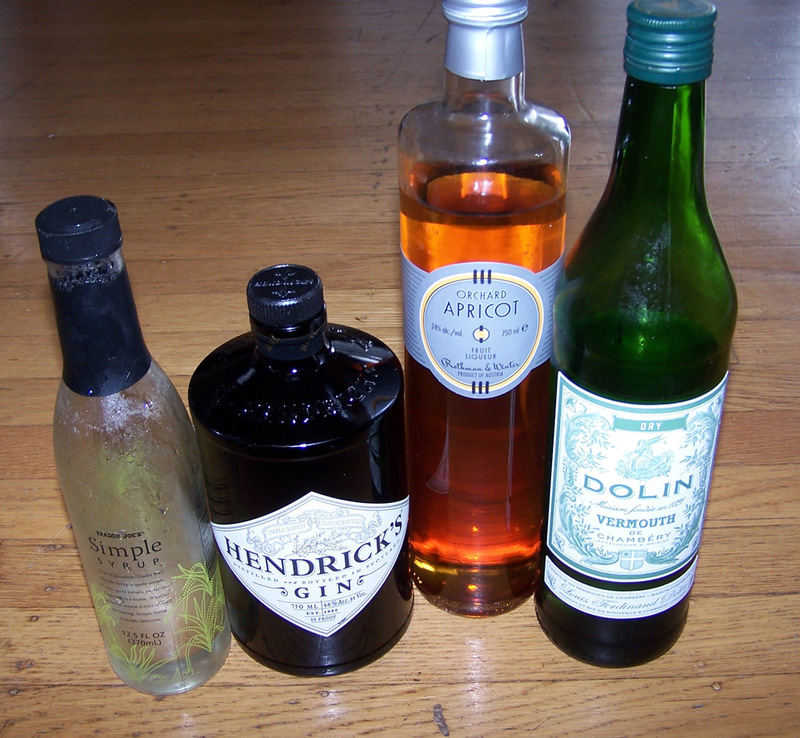 For this drink I really wanted to be able to taste apricot liqueur and gin, so I went with the tried and true formula of 6:2:1 base spirit, fortified wine, liqueur. The resulting drink was very dry, and when I tasted it pre-stir, the apricot was only salient on the swallow. Even though the apricot was mild, I could tell that much more was going to stop on the subtler notes of the gin and vermouth. Instead of liqueur, I added a bar spoon of simple syrup, and it brought out the fruit without clobbering the botanicals. I don’t have a name for this, but I do have a strong preference that you don’t try to call it an “apricot martini”. 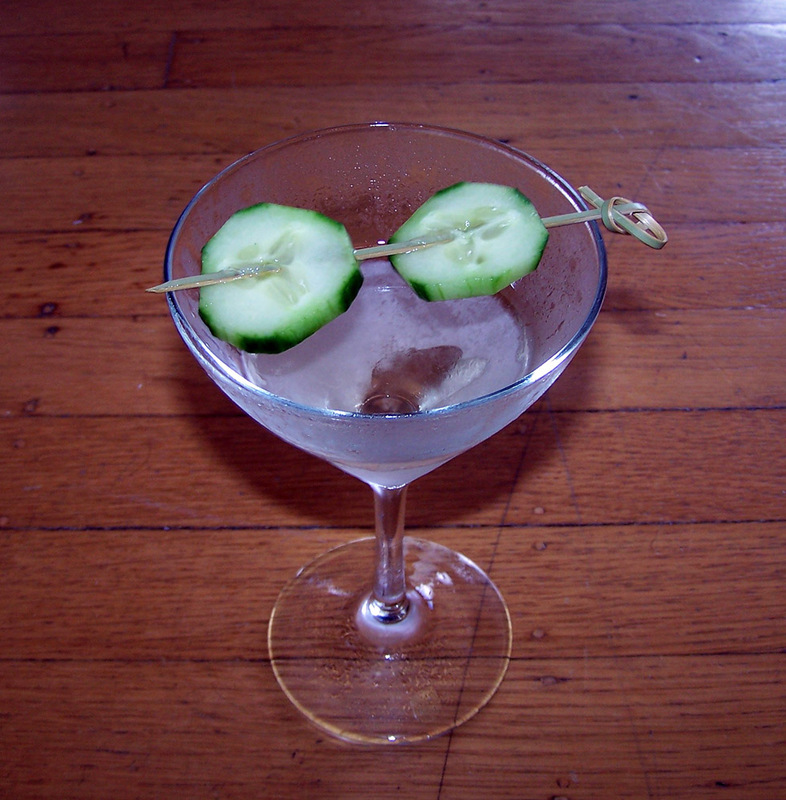 Stir over ice and garnish with a slice of cucumber. I make my own simple syrup, but I keep it in the trader joe’s simple syrup bottle, for convenience. I really need to get better at garniture. The orange hue of the apricot liqueur was not sufficient to give this drink even a faint color, but the flavor was there in just the right measure. It’s easy to invent a three ingredient drink, or a four ingredient drink if one of them is lemon or lime juice. Some kind of aromatic bitters would have been nice in this, but none of the ones I have on hand really struck me. Angostura is far too heavy for something like this, but fee’s orange might do the trick. Next time. The cucumber was pleasant to munch on after it sat in the drink for a few minutes, but a candied orange wheel would really have made this drink great. Categories: original creations | Tags: apricot, dolin, dry vermouth, gin, hendrick's, orchard, rothman and winter, simple syrup | Permalink. Have you tried this with the 6:3:1? I have not, but I was pretty happy with the balance on this one. Apricot is a very light flavor.